Tour My India proffer you one of the best Kerala holidays & tourism vacation packages with friendly hospitality. Make a booking as soon as you can to nurture your desires of exploring the beautiful attractions of this state. Widely dubbed as God's own country, Kerala is dotted with countless appeals that draw the attention of the tourists from all over the world. It is a land where you can take pleasure in an invigorating holiday. Kerala relishes exceptional environmental features that make it among the most sought after tourism places of India. It has everything one could dream. If you are a traveler looking for fun, excitement, exquisiteness or pleasure then pay a visit to Kerala, the must explore place in your lifetime. Get special discount on summer & winter 2019/2020 packaged tours. Kerala is blessed with ethereal beauty, and thus, it remains one of the best honeymoon destinations in India. With our incredible honeymoon packages at Tour My India, we offer newlyweds an opportunity to relish quality time together amidst the serene, surreal and sensuous surroundings of Kerala. Bank on us for choosing the best romantic getaways and rendering best in the industry services. The beautiful state of Kerala is home to some of the most stunning hill stations in South India. And with us at Tour My India, you have the chance to enjoy the beauty of these lovely destinations at its best. We offer ideal Kerala Hill Station Packages that are specifically designed to give you the best holiday experience. An unbeatable beach holiday is guaranteed by us Tour My India. Choose from the variety of Kerala beach tour packages that promise to fulfill your wish of having that ultimate vacation in the most exotic beach destination in South India. Get the most enthralling wildlife experience with our amazing Kerala wildlife tour packages. Packed with thrilling activities, our wildlife travel packages ensure that the adrenaline rush in your body is high and you get a memorable holiday experience. With our meticulously designed Ayurveda tour packages, Tour My India guarantees unmatched ayurveda experience in Kerala. We choose the best ayurveda retreats and craft itineraries carefully to offer you a holistic experience. Let us at Tour My India give you the best pilgrimage tour experience. Bank on us for the best itineraries on different Kerala pilgrimage vacation packages that are crafted meticulously to cater to all your needs while imbibing exceptional spiritual experience. Make your family holiday in Kerala an unforgettable one with Tour My India. We offer the best Kerala family travel packages that guarantee some incredible holiday with people who matter you the most. Our carefully designed holiday package ensure that each family member enjoys to the fullest and that the trip remains one-of-its-kind. Tour My India lets you make the most of Kerala’s signature backwaters. We plan a perfect backwater tour for you to enjoy the rustic charm of the state and imbibe the surreal ambiance that has been built over the amazing network of backwaters. 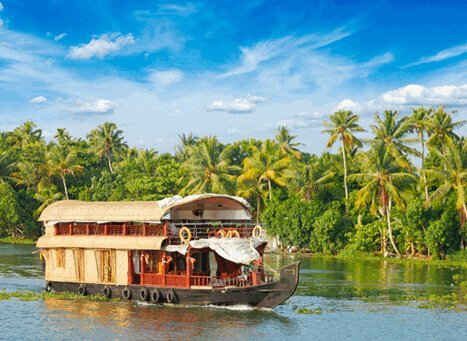 Enjoy unparalleled sail and stay in the gorgeous houseboats and the beauty of the village life of Kerala. The south Indian state of Kerala is a pit stop for luxury holiday seekers. Dotted with variety of boutique and luxury hotels, resorts, lodges and even camps, Kerala is hard to ignore when planning for a luxury vacation in India. Expect authentic and one-of-its-kind experience in this gorgeous state of Kerala.